But then when I added, “Whoever comes with me gets to get a toy out of the machine on the way out!”, both quickly changed their response and made a beeline to the car. I’m referring, of course, to those little vending machines you find near the door of so many grocery stores and restaurants. 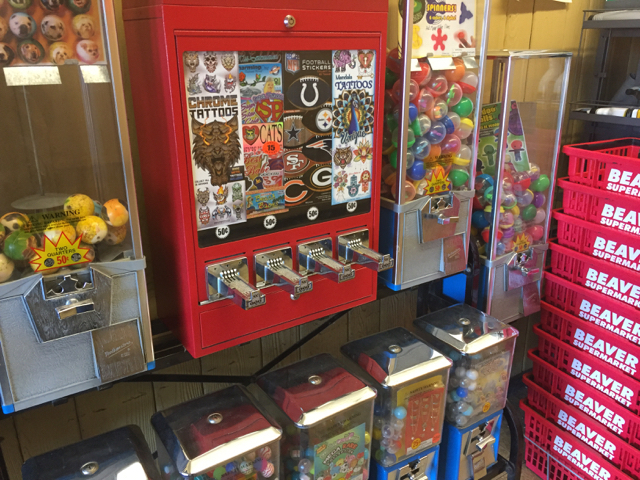 The ones where you pop in some change, turn the lever, and get some cheapo toy stuffed inside a plastic capsule. I know it’s all junk, but that’s OK. As long as my kids still get excited about it, I’ll keep coughing up the quarters. After all, one day in the not-so-distant future they’re going to walk right past those machines as they stare zombielike into their smartphones, endlessly texting their friends and taking duck-face selfies. If it takes a 75-cent, Made-in-China, miniature alien toy to keep this bleak future at bay for just a little while longer, I’m all for it. I too used to love those toy vending machines when I was a kid. My favorite was the one with the tiny plastic NFL helmets. I was always for the Steelers one, but more often than not I’d end up with the Baltimore Colts, Tampa Bay Buccaneers, or some other crap team. That said, it never stopped me from pressing my luck again the next time. It was the thrill of chance that kept me coming back. Boogieface tends to feed the machines that offer the cuter toys, like miniature puppies and kittens. The Animal, on the other hand, is always drawn to the ones offering things like toy weapons or skull-inspired jewelry. Go figure. What stinks now is most of these machines are at least 50 cents and sometimes even as much as a dollar. It’s one thing coughing up a quarter for a cheap plastic, gold-colored gun keychain, but for a buck…heck, that keychain should be gold plated. On the way out of Beaver Super the other day, The Animal was really hoping to get a mini fidget spinner but instead ended up with a flower-shaped eraser and a cheap plastic, fuzzy (beats me?) dump truck that broke in the car on the way home. Oh, well. Such is life. Boogieface, on the other hand, was much more satisfied with her prizes: a miniature rubber bunny rabbit and a super-sized bouncy ball featuring an adorable picture of a Pomeranian. I’m thinking about bringing out a similar line of vending machines for adults. Why should the kids have all the fun? Just, instead of fidget spinners or bouncy balls, mine will be stocked with those little airplane liquor bottles.